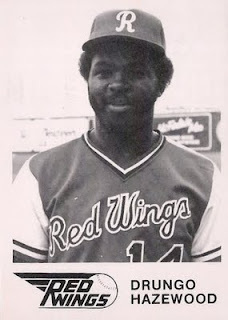 Drungo Hazewood was a first-round pick of the Baltimore Orioles in the 1977 baseball amateur draft. He showed some power in the low minors but had trouble with good old Uncle Charlie. He reached the show for six games at age 20 in September 1980, went 0-for-5, was sent back to down to the minors, stuck around for three more seasons and was done. His mother, Catherine, was a housewife who gave her life to raising ten children and helping to rear who knows how many grandchildren. With her ninth about to be born, Catherine announced a dare: Whoever wins a foot race to the hospital gets to name the baby. Her son Aubrey won the challenge, and he had a good friend whose last name was Drungo. So Drungo Hazewood it was. His middle name, by the way, is LaRue. Vote below. And please follow us on Twitter @NOTYtourney. No. 1 stonegarden grindlife: UCLA grad student. No. 16 Moe Lester: Canadian butcher. No. 9 Drungo Hazewood: Baseball legend.